Happy July!! This year is flying by and I can't believe summer is in full swing. Sorry about the radio silence on Wednesday and on my Instagram this week, I was really sick and couldn't muster the energy to do anything. Today I'm feeling much and so excited it's Friday! A few weeks ago we met one of my very best friends, her husband, and her beautiful baby for dinner after work. It was a gorgeous night so Mike and I decided to walk through a new-to-us park before hand. If you live in Boston and have never been to Larz Anderson Park, you must go. It was maybe the most beautiful park I've ever been to. Beautiful ponds, bridges, doorways, archways, trees, grass, I can't wait to go back! It's absolutely not a secret I love pink so when I saw this silk cami, I knew it would be perfect to add to my collection. It can be worn by itself in the summer or layered in the cooler months. I paired it with these amazingly comfortable navy shorts that have the cutest knot on the front! They are elastic in the back so you can eat as much as you want at dinner ;) I know I'll be pairing this cami with white jeans, distressed shorts, and even skirts throughout the rest of summer! Such a cute summery outfit! Love the pop of pink! Love this color combo, you look perfect for summer! Love this look, Emily! 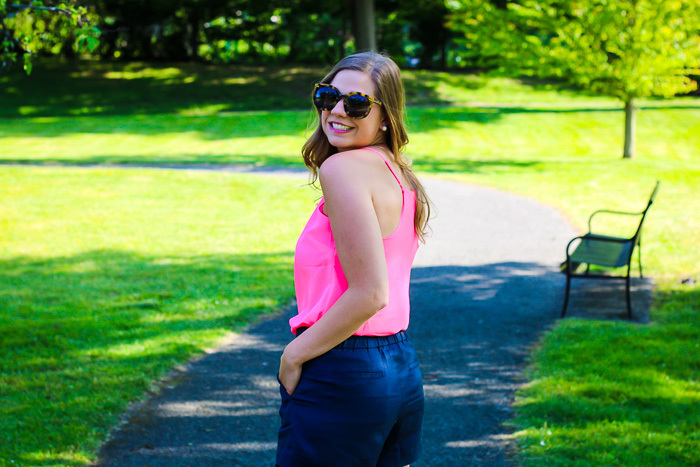 Navy and pink is one of the best color combos! Such a cute color combo for summer! I love keep silk cami's handy this time of year, they are so easy to dress up and down!